Inpaint will magically fill the selected area with intelligently-generated textures pulled from the surrounding image data. Go to our Tutorials page and see for yourself how easy it is for anyone to do with just a few simple steps. Download our Try-Before-You-Buy demo and use it on your own photos! Inpaint has been featured on NewsWatch TV. NewsWatch is a morning news television show aired on the History and Biography Channels. Frustrated by nasty tourists stalking back and forth and spoiling the best shots? Take them away from your photos with Inpaint! With few simple gestures you will get clear, spectacular pictures, just like you intended them to be. Inpaint's Magic Wand tool allows you to select unnecessary objects or persons on a photo in literally seconds, so all you have to do then is to let Inpaint do the rest. Aside from the information we truly want to see on our photographs, there are also many not so crucial for composition if not worse. These are camera date stamps, watermarks placed by various websites, and other objects we don't want to be on a picture. After all, if you gonna hang a photo on a wall, you want it to look eye-catching not due to various visual wreckage on it. So remove it with Inpaint! With simple and efficient tools you are able to remove any unwanted elements totally effortlessly. The devil is always in details. A tiny object on a photo can ruin the entire composition or even make it produce the effect opposite to that you initially were hoping for. Using Inpaint removing objects from photos is almost as easy as taking a shot itself. With merely three simple steps you can make power lines, tourists, buildings, background wreckage and other elements vanish as if they never were there. Old doesn't always mean bad. Some older photos we have are still important to us as they still carry value and bring positive emotions. Alas, scratches, spots and tears are an inevitable legacy of the old film photography, especially if we talking about aged pictures. Happily the digital copy of a scanned old photo can be easily retouched with Inpaint. This little yet capable helper will make all those frustrating defects go away with minimum efforts from your side. 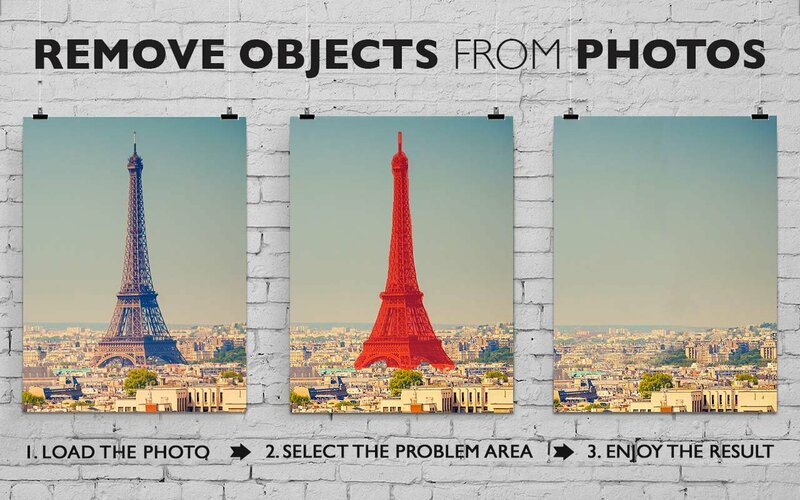 Just select problematic zones on the picture and fix them! Nobody is ideal. Yet still we want to look better sometimes - retouch some wrinkles, remove skin defects. Indeed, what a wedding photo would bear redness or pimples on the bride's face? What about prom album or a dating site? 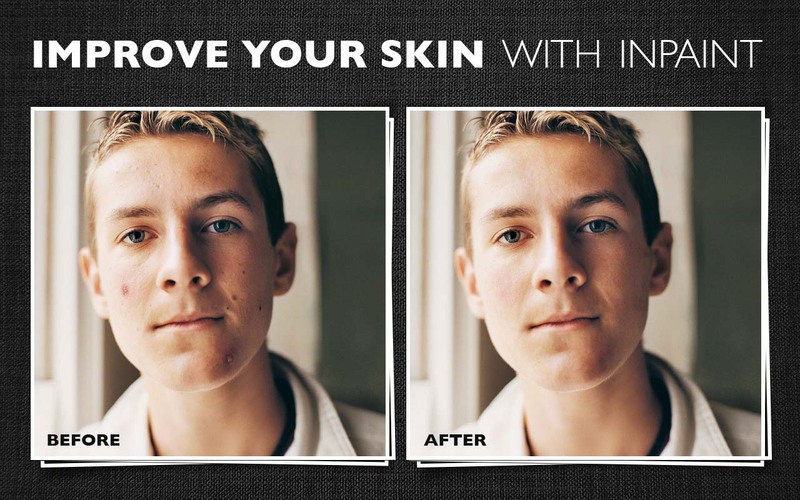 Inpaint allows you to quickly improve your skin on photos and conceal everything you don't want to show. Just apply the Marker tool or the Magic Want tool to every problem zone and instantly see the difference! Inpaint photo restoration software reconstructs the selected image area from the pixels near the area boundary. Remove undesirable objects from your images, such as logos, watermarks, power lines, people, text or any other undesired artefacts. There's no need to manually go through messing around with your old clone tool any more! Now you can use Inpaint to easily remove all those unexpected objects that end up spoiling an otherwise really great photograph. BatchInpaint is a batch version of Inpaint. 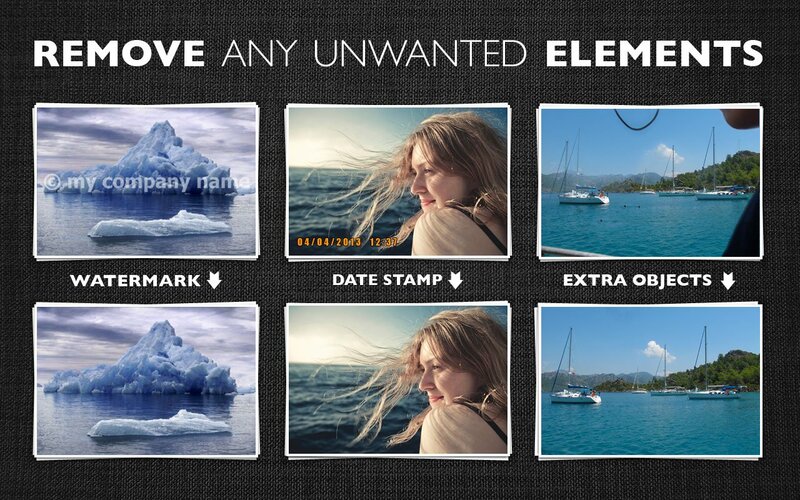 Now you can remove watermarks, date stamps and other unwanted objects in a batch mode. Multi-View Inpaint allows you to remove moving objects such as vehicles, construction work, or simply other tourists from the photo by blend different areas of two or more pictures of the same scene. Inpaint works so well! 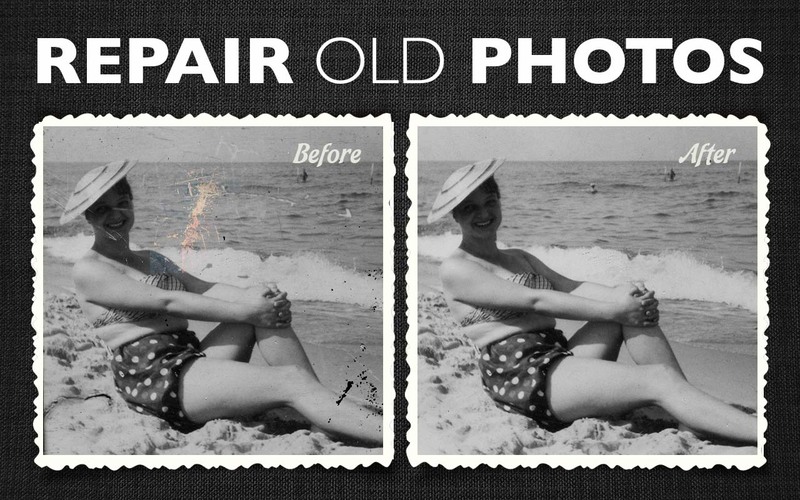 If you are needing a quick and easy way to repair old photos or remove watermarks or annoyances from pictures, it's perfect. 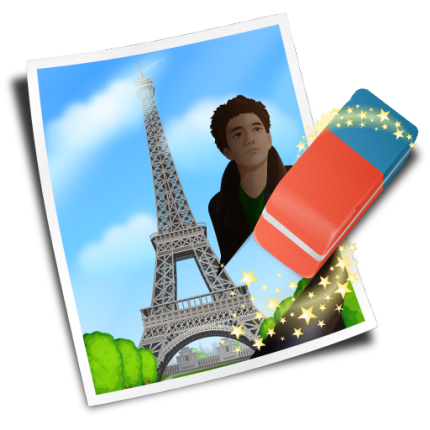 Inpaint makes it easy to remove objects from your photos. The app can also easily remove time and date stamps from photos, remove blemishes from a face, or repair old scanned photos to get rid of tears or other defects. Removing the date stamp took seconds! A great time saving program. Inpaint does an amazing job at removing people from photos. A "must buy" for anyone that cares about their pictures enough to want to touch them up a bit! This app does what it says it and does it well. Removing watermarks? Simple. Getting rid of date stamps? Simple. Remove people from photo? Incredible! I've been wanting a cheap and easy way to remove details from my photos and this does it really well. Messed around real quickly on some photos to take out some complicated wires and other stuff in a zoo photo ... the results were FANTASTIC. If I would have taken my time they would have been triple fantastic! Inpaint is a nice piece of software for those who want to retouch their home photos without the need to read thou war and peace in order to use. The installation is very straight forward. The program is a pleasure to use and the results are very good and no so quick and without having to learn how to use a clone brush. I recommend this to anyone who wants to retouch a photo and it is ideal for a beginner. Worked beyond my expectations. Did simple removals flawlessly. I hair on the camera lens was perfectly removed, as was a person on an otherwise deserted beach. Removing a lot of complicated items from a very detailed picture kind of choked the program, but I wouldn't expect any software to be able to do that. If you're an amateur photographer and you want to do some basic editing of your pictures to remove unwanted objects, grab this software right now! Wow, this works much better than I expected. I'm a Realtor so removing dirty underwear from the bedroom picture is a must. I use the Photoshop clone tool quite often for this kind of application. But Inpaint gave me almost the same result in less than 3 seconds. Very impressive. From now on, I'll use Inpaint for unwanted object removal. This is a big time-saver. Excellent! Outstanding! Great Job! Superb! Wonderful! Fantastic! Easy! Fast! I love it! It can easily get rid of spots, or weird objects, and if you are really patient, you can get rid of most anything you don’t like in your pictures! Easy to use, really amazing results. I couldn’t believe it the first time I used it.